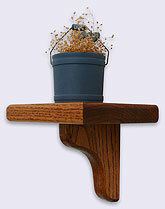 Dave's Wood Goods specializes in building handcrafted wood items from select ¾ inch solid red oak wood. All products, except the pens and pencils, are treated with Zar Brand "Early American" oil based stain. The wood pens are treated with Zar Brand "Walnut" stain. Therefore, any variation in color is caused by the wood itself and not by the finishing process. See the general description of each item below, or click the appropriate tab at the top of this page to view details and order each product. 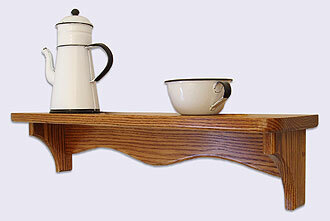 The primary product, of Dave’s Wood Goods, is decorative wooden wall shelves. These are elegant shelves that would look good with any décor. 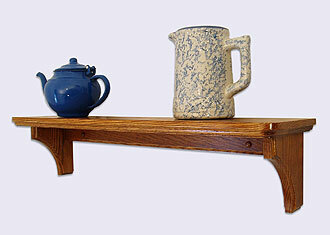 These floating shelves are created in Country, Modern and Small styles. The country style uses a straight backplate design while the modern and small styles use a wavy backplate pattern. Shelf, without rails and pegs. Shelf, with shaker pegs only. 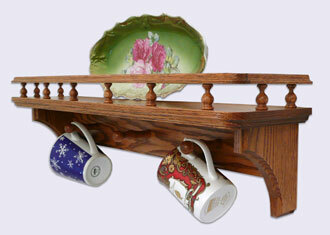 Shelf, with mug pegs and gallery rail. Country and Modern shelf styles are available in 24, 36, and 48 inch lengths. The Small Shelves are available in 5, 12, 16 and 20 inch lengths. Each wood shelf is meticulously inspected during all phases of construction in order to guarantee a high degree of quality and craftsmanship. All wall mounted shelves have pre-drilled holes or keyhole slots for easy installation in your home or office. These shelf units can be used for displaying items such as: plates, coffee cups or mugs, pictures, knick knacks, antiques, art work, craft items, trophies, models, beer steins, and more. The smaller shelves work great as speaker shelves, for stereo or surround sound speakers. Feel free to browse our selection of handmade decorative wall mounted shelves, and contact us if you have any questions. Brackets and backplate edges are cove. Shelf bottom edge is roman ogee. Backplate style is straight. Brackets, backplate, and shelf bottom edge are round over. Backplate style is wave. A Quilt Hanger with shelf, or quilt rack, is a great way to display your quilt. The 5.5" shelf gives you a place to display any objects or pictures that may be associated with your quilt. 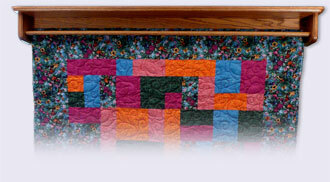 Quilts up to 48 inches wide can be hung using the pincher bar mechanism. These solid oak coat racks / coat hangers would look good in any room of your house and can be used to hang coats or mugs or any decorative hanging item. 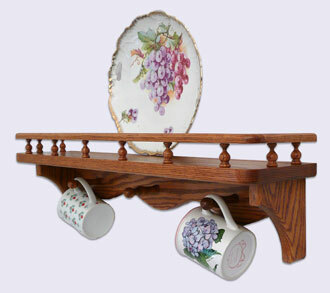 Shaker style pegs are used with the coat racks, however if you want mug pegs just send me an email. These stylish oak wood pens and mechanical pencils make a wonderful gift for friends or family. The "body" of each pen and pencil is made from red oak which is cut at an angle to expose more of the grain pattern. Both pens and pencils use high quality components with 24kt gold plating on the exposed metal parts. There are currently 3 styles available (Slimline, Designer and Cigar) as shown in the adjacent picture. As with all products, these handcrafted gumball machines / jelly bean dispensers are made from solid oak wood. Each dispenser is finished using the same process as our decorative wall shelves. And of course, you can fill the jar with Jelly Bean’s or M&M's® instead of gumballs. Order this unique gift item today!